Here are the most common questions I've been asked so far. How long did it take to write Roseanna's Reply? Roseanna's Reply took two years to write, usually three to four hours a day of work. It took another 18 months to get it right after the first draft was complete. By that I mean, after 18 months, enough people had read the proof copies and I had made enough changes and corrections that I was finally reasonably happy. As a writer, I don't think you ever get to the point where you are satisfied with a manuscript, you're just done with it. When you started writing, did you know where it was going to end up? Of course I had a basic story in mind from the beginning and that never changed.and I think that might be a little unusual, particularly with serious (as opposed to hack) historical fiction because it really is a journey. It is a complicated story. How did you keep track of all the details? I had an outline and continued to scribble notes to myself during the writing process. Just as important, I also had an 8-foot long timeline pasted on the wall so I could be accurate in melding historical events and details into the fictional story. What is special about Roseanna's Reply? When you look at most of the historical fiction on the market, I think it is fair to say that Roseanna's Reply is out of the ordinary in a number of ways, and this was by design. Its structure is out of the norm. It does not follow the strongly advised formula for its genre. There are hundreds of non-fiction books out there on the Mustang. But I have not found another novel that treats the development of the P-51 Mustang, the world's most famous fighter, as the central point of the plot. Why does the Mustang have such a cult following? The airplane certainly does have a huge worldwide following of aviation buffs, WWII history enthusiasts and just plain folks who will drive hundreds of miles on a weekend to see a couple of these things fly at an airshow. There are more than 150 Mustangs flying worldwide and, believe it or not, their numbers are actually growing rather than declining. This is an airplane that was designed nearly 70 years ago, costs about $2,000,000 to buy today (if you can find one for sale), and burns about 60 gallons of aviation fuel for each hour of operation. Why is it so popular among pilots and fans alike? All I can tell you is that you have to see, hear and feel one go by on a low pass to understand. A lot of people will tell you that even the Thunderbirds or Blue Angels come in second place. 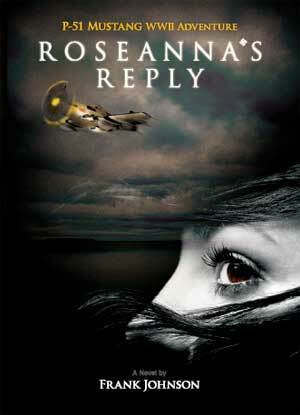 What was the biggest challenge in writing Roseanna's Reply? Book publishing has changed dramatically in many ways during the last few years, and that rate of change is accelerating. One of the truly revolutionary changes has been with the advent of on-line book sellers, Amazon leading the way. Every piece of historical fiction in publication today, is available from Amazon or its competition. One of the revolutionary changes that has come with this is that Amazon encourages it customers to post reviews of the books they purchase. No longer does a prospective reader have to depend on the hackneyed recommendations of professional book critics. In an instant, they can learn what real people.just like them.really think of a book. Most of the reviewers are brutally honest. So this was a real challenge with a book like Roseanna's Reply that tries to cover a lot of ground in one volume. Write a boring story or get some of your historical facts wrong, and these people will rightfully rip your book to shreds and dramatically effect sales. More than a few formerly best selling authors have learned this the hard way. Combine this with the fact that there are so many Mustang history experts out there who take great pride in arguing every minor detail and you can understand the risk an author takes tackling a subject like this with the claim that the historical context is accurate.